We have GREAT news!! We’re in the process of making all of our Plus Size Children patterns downloadable – to make them instantly available to everyone, whether you’re in the U.S., or around the world!! During this transition period, we’re selling the remaining few of our Plus Size Children physical patterns at a huge 50% discounted price. The price is normally $14.95, and while these last, we’re marking them down to $7.50 (no coupon code required). When you get to SewWithSarah, just hover over “sewing patterns” to see all the Plus Size Children pattern categories. 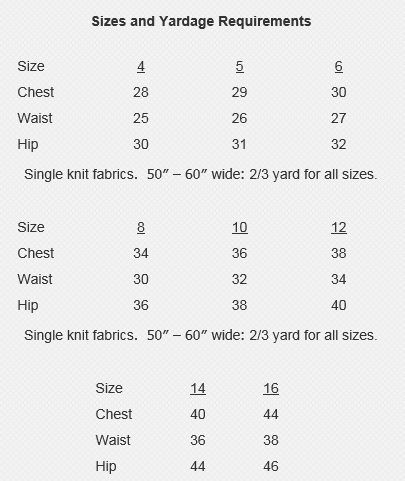 Compare YOUR overweight / plus size boy/girl measurements to our size chart (below). Our plus size kids patterns are all made according to REAL plus size children measurements, so in most cases the measurements of your 10 year old (example) would be right on, or very close to our size 10 size. These patterns come in 3 size ranges: 4-5-6, 8-10-12 and 14-16. 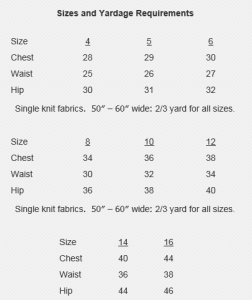 The above size chart came from a blouse pattern, thereby stating the amount of fabric needed — each pattern has the same sizes, with corresponding fabric requirements for that particular pattern style. These patterns are going fast — and once the physical patterns are gone, you will have to wait for the downloadable patterns to be put online. Remember, we’re giving you a 50% discount — no coupon code required while they last — no backorders. NOTE: Because of shipping costs, the physical patterns are only available to customers within the U.S.
School Starts Soon. 50% Sale Starts TODAY!